According to the Los Angeles Times, Disney has hired an Oscars strategist with financial backing from Marvel to launch a campaign. The Marvel Cinematic Universe has never won an Oscar, but “Black Panther” is its best chance so far. The movie was a cultural and box-office sensation, but the introduction of a “popular film” category may be the biggest thing standing between the movie and a best-picture nomination. Awards season is looming, and Marvel Studios and Disney are eyeing the Oscars. According to the Los Angeles Times, Marvel is making a serious “best picture” push, for the first time ever, to get its highly successful blockbuster “Black Panther” nominated for the Oscars’ top prize. The Times reported that Disney, which owns Marvel, has hired a veteran Oscars strategist, Cynthia Swartz, to lead a best-picture campaign backed by significant funding from Marvel. Movies within the Marvel Cinematic Universe have, for the most part, been absent from the Oscars, despite their consistent critical and commercial success. If they have managed to be nominated, it’s been for technical awards, primarily for visual effects. No MCU movie has ever won an Oscar (even “Suicide Squad,” part of the rival DC Extended Universe and despised by critics, won for makeup and hairstyling at the 2017 ceremony). That means Marvel has a lot of faith in “Black Panther,” and rightfully so. The movie was not only a box-office juggernaut – making a rare $US700 million domestically and $US1.3 billion worldwide – but lauded by critics, with a 97% Rotten Tomatoes critic score. 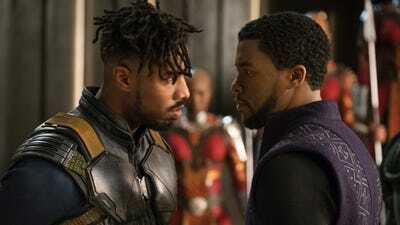 The movie was praised for its diverse cast and African setting that had never been seen in a superhero movie, and the performance of Michael B. Jordan as the villain Killmonger. The Oscars, after being panned for its lack of diversity, has shown some progress the last two years in that regard: “Moonlight,” about a black, gay man struggling with his identity, won best picture in 2017, and “Get Out” won best original screenplay at this year’s Oscars. It was also nominated for best picture, best director, and best actor. But the Oscars have also historically ignored superhero movies outside of technical categories, save for “The Dark Knight,” in which Heath Ledger won posthumously for his performance as the Joker, and “Logan,” which was nominated for best adapted screenplay. The biggest thing standing between “Black Panther” and a best-picture nomination, though, may be the introduction of a new, controversial “achievement in popular film” category, which has been mocked by critics and celebrities alike. Details are scarce about the category right now, but we know that movies can compete in both categories. The fear, though, is that “Black Panther’s” inclusion in the popular film category could ruin its chances of a best-picture nomination.